Bass lakes are all over this great country. 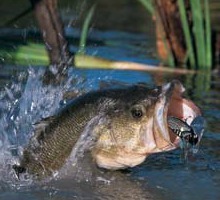 States such as Texas, Alabama and Florida all have world class bass lakes. Florida has over 7,000 lakes and a few of those lakes are visited each year by anglers from all over the world. They are all seeking the Trophy Bass Adventure and experienced guides who can make that adventure happen. But they are not the only ones who fish these bassin' lakes. Maybe you have a son or daughter who wants to find out why dad spends a lot of time looking through bass fishing magazines, checking out all the best bass fishing lures and tackle. Maybe you are a serious bass master(ha! ), who is looking to hone your skills for an upcoming bass tournament. Charter yourself and a buddy a 2 or 3 day fishing trip, or longer if you want. A half day charter on lakes in Florida, Alabama and Texas is not expensive at all. Most guides supply everything you need except the food! Catching bass in large world famous lakes is a memorable experience for anyone. But I like smaller fishing holes. My passion is to explore and catch bass in state parks. 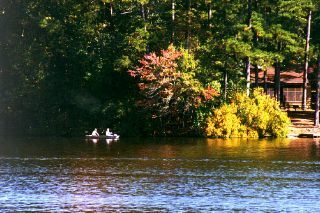 Some of the best bass lakes can be found in state parks all around the country. These parks have every kind of accommodations from primitive camping up to resort lodges. I personally enjoy the nice cabins available for rent. These cabins have everything you want to enjoy a weekend or a week. Just bring your food. Also boats are available for rent in most parks. I have spent many extended weekends in some of these cabins and fishing the lakes. After experiencing some good bass fishing, beautiful scenery and a lot of peace and quiet, I most always wanted to stay a little longer. It does not matter if you are a pro angler or a youngster who just now wants to learn how to fish. And it does not matter if you catch a boat full of big bass or don’t catch anything at all. The fishing trip is most always enjoyable and full of memories of a good time had by all. So all you need to do is find a good fishing hole. Do you want to have a good chance at landing a monster bass like the one on the right? Contact experienced guides. Read fishing reports. Search these states and others for lakes, rivers and state parks. Ok, most anglers know about the world record largemouth bass caught in Georgia many years ago. 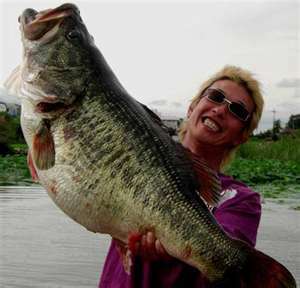 And some anglers know about the bass that was caught in Japan that tied the world record. Jason Covington has written a book about a couple that raised a 27 pound largemouth bass. 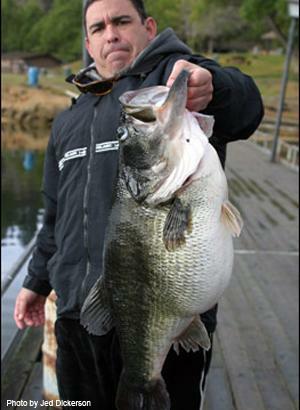 The monster bass was raised in a private lake in Kentucky. Mr. Covington discusses the ethical issues of this project. To learn more and to purchase the book click here. Below is the largemouth bass that tied the world record and the angler who caught it. To read more details about this amazing story go to fishing.about.com.